Are you waiting for opportunities? Instead of waiting for opportunities to knock on your door (which will never happen because ‘opportunities’ doesn’t have hands), make them! The Boston Marathon is undoubtedly one of the well-known marathons and serious runners from all over the world dream to take part in this prestigious marathon. It is held yearly and it attracts at least 500,000 spectators and participants each year. Both amateur and professionals run in this most-sought-after event and this year, the first american man to win the Boston Marathon since 1983 crossed the finish line. It was Meb Keflezighi, 38 years old, who finished and won the men’s division with a time of 2:08:37 (which is technically a 2-hour “sprint” for most people). Read more about Meb here. The Boston Marathon has encountered lots of issues and controversies through the years, unfortunately including the Boston Marathon 2013 bombing, but did you know that women were not allowed to run in this race until 1967? Women were barred from running the famed Boston Marathon for over 70 years! 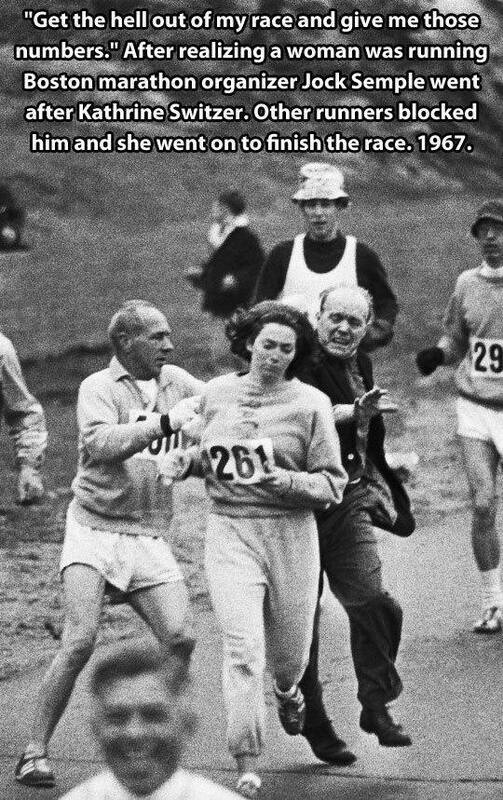 History tells us that women were generally excluded from participating in sports, and this includes running the Boston Marathon. However, a woman named Kathrine Switzer made the first attempt to run over this barrier and succeeded. Kathrine was a student from Syracuse University and she was only 20-years old when she registered for the Boston Marathon using her initials K.V. Switzer. No one realized that she registered a woman and she was able to officially sign up for the race and was given a race entry number. During the race, a marathon official (balding guy in the photos) realized that a lone woman was running the Boston Marathon among hordes of men. This official tried to stop Kathrine and physically forced her to run the marathon when he discovered K.V. was a female runner. Other runners including Kathrine’s boyfriend helped Kathrine continue running and blocked the official from stopping her. 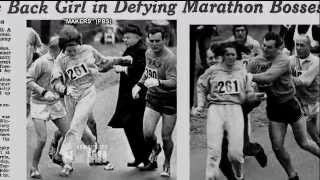 The lone female runner in the 1967 Boston Marathon made headlines around the world and proved that anything can be done in spite of hindrances. After running the Boston Marathon, Kathrine Switzer engaged in promoting sports participation among girls and women. With the help of other passionate women, the Boston Athletic Association finally was convinced to drop their discrimination against women and allowed them to participate in the race in 1972. Because of Kathrine’s dream and perseverance, the Boston Marathon opened its starting line to women, and by 2011, almost 43% of the Boston Marathon runners were female! Apart from the Boston Marathon, Kathrine Switzer also helped lead the drive to include women’s marathon in the Olympic Games which was achieved at the 1984 Summer Olympics in Los Angeles. Kathrine also has a book entitled Running and Walking for Women Over 40 : The Road to Sanity and Vanity by Switzer, Kathrine  which is very inspiring for people over this age. It’s never too late to run! Also check out 26.2 Marathon Stories written by Kathrine Switzer and Roger Robinson, an elite international runner for thirty years (1966-1995)! Did you know that today in 1992, the National Hockey League Players began their first strike after 75 years in the league? Shouldn’t Professional Athletes be Paid for their Skills and Talent? We can argue that these players deserve to be paid because of their talent, skill, and dedication. But sometimes, this incentive becomes the motivation for the players’ whining. Throughout the years in sports, teams and even individual athletes threaten not to play unless their demands were met – and these demands usually involves (getting more) money. Labor unions got involved and by forming player associations such as MLB, NBA, NFL, and the NHL, these athletes have been having more ‘power’ to demand their wants. This results in what we know as either a strike by the players or a ‘lockout’ by the owners. The 1992 NHL strike lasted for 10 days and ended with unresolved issues. 2 years later, NHL had a worse lockout which reduced the games from 84 to 48. Why do Professional Athletes Hold Strikes and Lockouts? It all usually boils down to money but issues such as playing conditions, benefits and feeling that the owners are unfair are also common reasons for staging these strikes. No matter what the reason may be, these whining and complaining costs lost games, discouraged fans, and even broken relationships between athletes and managers. Athletes ought to play for the love of the game. They used to, and many still do. But some act like spoiled brats forgetting their fans and teammates and the contract they already signed to ask for new demands and opportunities. Athletes become self-centered and egoistic. They won’t ask for more money if they don’t think that they deserve to be paid more. In the American Hockey League (AHL), the minimum salary that a player can receive in 2012-2013 is $32,500. However, there is no maximum salary that they can earn. What makes an Athlete a Winner? No one likes a player who always complains and whines. Surely, being a whiner is not a characteristic of a winner. The character of athletes is seen in what he or she prioritizes. Yes, the discipline, hard work, and sacrifice that athletes give for their sport is priceless, but getting the rewards should not be the focus when playing sports. There are lots of values that can be learned through Sports. Children and Teens look up to their ‘sports idols‘ as an example. What Values can the Youth Learn through Sports and How? Above is a link to a blog about what values that the youth can learn through organized sports. It listed discipline, hard work, sacrifice, dealing with success and failures, striving for goals, prioritization, and overcoming adversity. Another value that I think is very important but is usually neglected in the sports world today is “Humility.” All the praises and fame that a athletes can receive makes them forget how they should keep their feet on the ground. Unique skills are adored. Displayed brutal talent is admired. Humility is forgotten and sometimes thought to be for the losing ones. “True humility is intelligent self-respect which keeps us from thinking too highly or too meanly of ourselves. It is awesome to see how a player can do amazing stunts that others struggle to do, but it is more wonderful to see people go beyond their own comfort to make the life of others more meaningful. Only a humble person can do that. Only humble athletes can play in spite of hard opposition and difficult circumstances that put them down. Do you feel like whining when things don’t go your way? Do you quit easily when walk out when you get hurt or things seem unfair? Be a winner, not a whiner! This post may be a bit late as the less familiar Sochi 2014 Paralympic Games had their closing ceremony almost two weeks ago, but I believe it’s not too late to be inspired by these amazing athletes who did not let anything keep them from doing their best. It is only the 11th Paralympic Winter Games held for athletes with disabilities under the International Paralympic Committee (IPC). The Games featured 72 medal events in five known sports from the Olympics, and is the first Paralympic that held a snowboarding event. Amidst the stark international tension regarding the country’s intervention in Crimea, Ukraine the Paralympic Games went on. Canada stayed in top 3 with a total of 16 medals having 7 of them Gold. The host country had 30 Gold medals from 80 medals in total which kept them in first place. Forty-five National Paralympic Committees joined in Sochi 2014 Paralympic winter games with Brazil, Turkey, and Uzbekistan joining for the first time. Brian McKeever wins his 10th career gold medal. Brian McKeever, Canada’s cross-country skier and biathlete who began skiing at the age of thirteen. He lost his vision at the age of 19 due to Stargardt’s disease. He won gold in men’s 20km visually impaired cross-country skiing race in Sochi 2014 Paralympic Games. Oksana Masters is a Ukranian-born Paralympic rower and cross-country skier from the U.S. Nordic Skiing Team. She was born with several radiation-induced birth defects including different leg length, missing shin bones, webbed fingers with no thumb, and six toes on each foot. She was sadly abandoned by her birth parents at a Ukrainian orphanage until 7 years old. Then she was adopted by Gay Masters, a professor who had no children of her own. Billy Bridges is a Canadian ice sledge hockey player who has spina bifida, a congenital disorder that causes the spinal cord to remain unfused and open, sometimes protruding through the bones. He and the Canadian team won the ice sledge hockey bronze medal in the Sochi 2014 Paralympic Games. 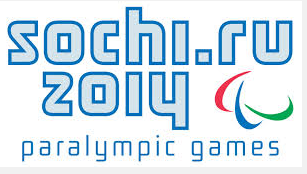 You can read other quotes from the Sochi 2014 Winter Paralympic Games here. Sometimes, taking the first step is the hardest thing to do. We haven’t even started the task yet, but we already are feeling anxious. This usually leads to procrastination and we’ll be unproductive. Most people who want to start their healthy lifestyle have lots of reasons for not taking that first step. They may feel intimidated by friends and people in the gym or group class. They might think they would injure themselves. They are not sure on how to exercise properly. But all of these fears are in our minds. We won’t finish if we don’t get started. “All personal achievement starts in the mind of the individual. Your personal achievement starts in your mind. The first step may be the hardest, but you won’t get something done unless you take it. Don’t let your fears overwhelm you and keep you from reaching your goals. Fix your mind on your goals and be determined to achieve it.